I knitted this cardigan for my grand daughter. 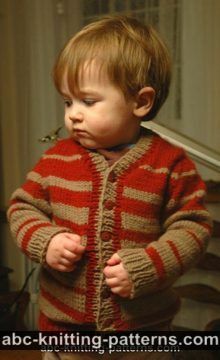 The cardigan will fit a large toddler / small child. 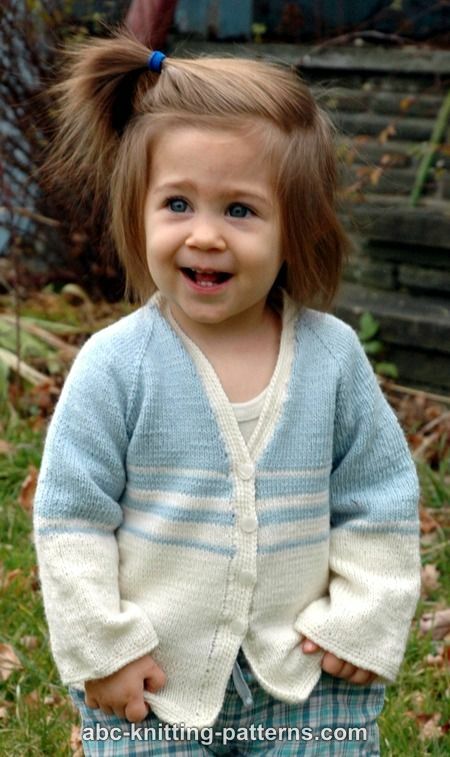 The cardigan is knitted from the top down without seams. It features raglan-style sleeves. 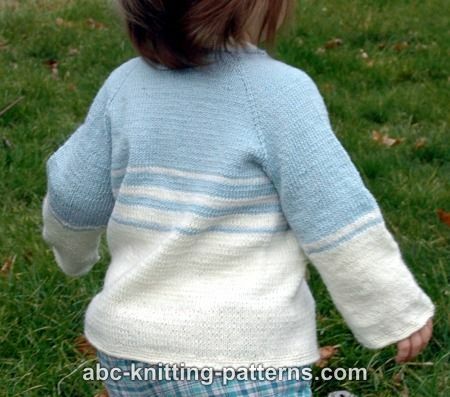 I chose a very simple motif of blue and white stripes that fade into each other, but it's possible to make the yarn changes wherever you want them. This will not affect the basic construction of the cardigan. You might want to try having thicker, thinner or more stripes than I did. 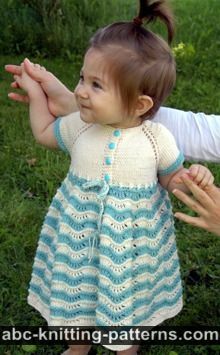 I really like seamless patterns in general, and I think they're the best choice when it comes to clothing for children and babies. No seams means no chafing, more comfortable fit and easy-on, easy-off. For sleeve you can also use circular 16” US 1 needles. The front openings of the cardigan are finished with chain selvedge. There is 1 selvedge st added at the beginning and the end of the row. 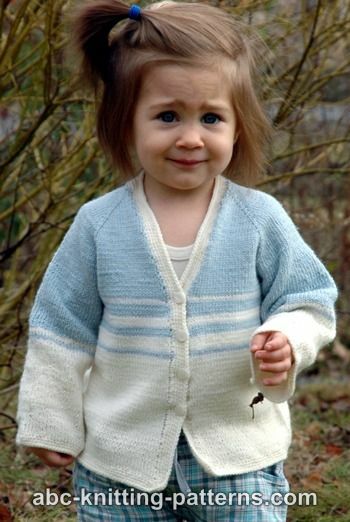 The cardigan is worked top to bottom, back and forth without seams. Work 48 (52, 54) rows increasing by 8 sts (double increase at the raglan sts) in each odd row as follows: M1, k1 (raglan st), M1 at the raglan st.
At the same time increase by 1 st at the beginning and the end of the row (2 sts per row) in every 4th row 10 (11, 12) times and in every 2nd row 4 (4, 3) times. 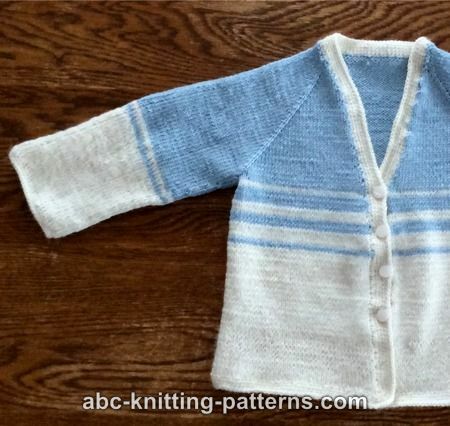 The increases for neck shaping include 3 sts on each cardigan front for the button band. Stitch count before division for sleeves: 267 (287, 295). Row 49 (53, 55): work the left front sts, transfer the left sleeve sts to a length of yarn, cast on 7 sts with single cast on for the underarm, work back sts, transfer right sleeve sts to a length of yarn, cast on 7 sts with single cast on and work right front stitches. Include raglan sts with the fronts and back. Place markers at the center of the underarm. Continue to work bodice back and forth in stockinette st for 78 (92, 104) more rows or to desired length. Bind off. Sleeves are worked in rounds in stockinette st. Transfer sleeve sts from the yarn to the needles and pick up 7 sts over the 7 underarm sts. Place a marker at the beginning of the round (4th underarm st). Work 60 (78, 86) rounds or to desired length. Decrease at marker 2 sts by working s2kp2 in every 12 round. Bind off. For the button bands, neckline, bottom of the sleeves, and cardigan hem, I used a crochet finish. Work 5 rounds of sc along the cardigan fronts, bottom and neckline. In the 3rd row, work *ch 2, skip 2 evenly starting from V-neck, 4 times for buttonholes. Work 5 rounds of sc along the bottoms of the sleeves. 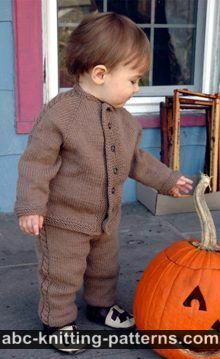 If you don’t crochet, you can finish the cardigan with the garter stitch. Work 6 rounds along the cardigan fronts, bottom and neckline. Work button holes in the 3rd round by working *yo, k2tog for each buttonhole. Work 6 rounds of garter st along the bottom of the sleeves. Really like this pattern. Being stocking stitch means lots of different effects can be produced by using variegated yarns, or different stripe widths. So versatile. Thank you.